The IDS Detector Duo uses radar technology to locate buried utilities before starting trenching, drilling or no dig operations. 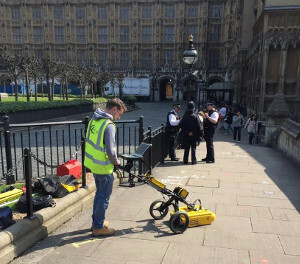 Cadmap Underground Surveying operates the IDS Detector Duo which locates the exact position of pipes, cables and bedrock. The Detector Duo helps prevent damage to cables and pipes and to avoid the risk of pipe rupture during trenching and drilling operations. The team of trained utility surveyors map out the lines of pipes on site with spray paint on the ground which are then surveyed using Leica total stations to create a AutoCAD drawing file. Detector Duo is the only GPR that uses two separate antennas ( 250 MHz - 700 MHz ) for increasing resolution and the depth of investigation in order to limit interpretation errors. The underground survey team also operate Radio Detections most advanced pipe and cable locator the RD8000 and TX10 unit. Cadmap Underground Surveying attend site equipped with an original topographical survey which shows the position of all service covers. 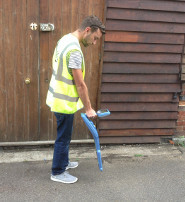 The surveyors traces underground cables, pipes using Radio Detection methods and Ground Penetration Radar 'GPR'. 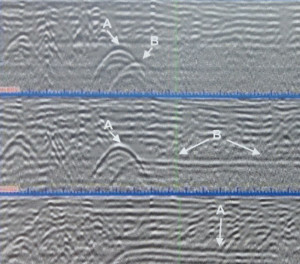 This information is then added to the existing survey, all connections, depths to pipes or cables direction are clearly presented on the drawings.